A favorite—and photogenic spring holiday is Easter, bringing with it fancy spring dresses, colorful Easter eggs to decorate along with exciting egg hunts to participate in and visits with the Easter bunny. 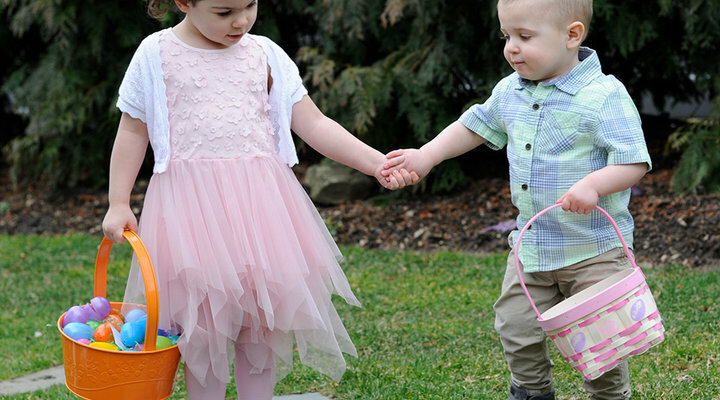 What’s more heartwarming than brother and sister holding hands as they search for Easter eggs. Kids love to show off their found treasure and will likely be eager to supply a wide smile as well. Whether you’re photographing your kids decorating Easter eggs, running around the house or yard on the hunt for hidden treasures or chomping on the ear of a candy bunny, candid photographs are often the favorite captures you can make. They’re natural, with no posing or fake grins filling the frame. Because your little ones will be in motion much of the time, you’ll want to use a fast shutter speed to capture the action. To do so, you can set the camera on shutter priority which will let you choose the shutter speed and the camera will choose the corresponding f/stop. Pick a shutter speed of at least 1/500 of a second to make sure you freeze their movements. You may need to increase your ISO if it’s a dreary day or you’re taking pictures inside without a flash. You can also use the Sports scene mode, which will set the camera for capturing action. Check your camera's manual to see if yours offers Scene modes. Photograph the eggs before they’re dyed and decorated. Think about how your photos will tell a story. This image features a bowl of eggs ready for decorating, as well as the jars that will hold the colorful dyes, out of focus but distinct enough to make out, in the background. Along with a shot of the eggs alone, a shot of the jars full of colorful dye helps to tell the story of a day of decorating. A dozen decorated eggs sit in the carton. Shot from above with a lens wide enough to also include the jars of colorful dyes tells a story in one frame. The photographer focused on the toddler’s hand holding an egg over a jar of dye, for emphasis, but you can still make out the curious expression on her face. Zoom in and capture the details, like this toddler’s tiny hand carefully dropping an egg into a jar of dye. Set up for a portrait, here the photographer snapped a candid of this little girl counting the eggs in her basket. Asking a child to do a simple task like count the treats in the basket will make an endearing image. Similarly, children will be happy to show off a brand new stuffed animal, and you're sure to capture a genuine smile. Take a silly photo like one of your daughter wearing bunny ears for the camera, but also take a normal photo too. The photographer was able to capture a beautiful portrait of this little girl, without the Easter bunnies and baskets in the frame, for a timeless photograph. To see more of Kristina's photos visit her website: www.kristinamariefoto.com.